Ordinarily I ignore a film’s production backstory, since being mindful of those details undermines my immersion in the diegetic world, and hence the story the filmmaker wants to tell. But with This Is Not a Film (In Film Nist, 2011) I make an emphatic exception. In this case the production backstory is essential to the film’s subject – freedom of expression in the face of a despotic regime. 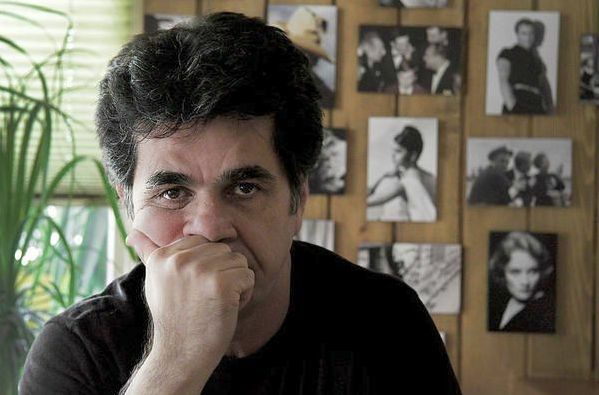 The background story concerns the distinguished Iranian filmmaker Jafar Panahi’s arrest and confinement by the Iranian authorities following the widely disputed 2009 Iranian presidential “election”. Panahi, who had supported the defeated Green Movement candidate, Mir-Hossein Mousavi, was arrested shortly afterwards when he attended a cemetery gathering to mourn the death of Neda Agha-Soltan, who had been gunned down on the streets during post-election protests. Although Panahi was later released from prison, he was banned from leaving the country and was rearrested in March 2010. 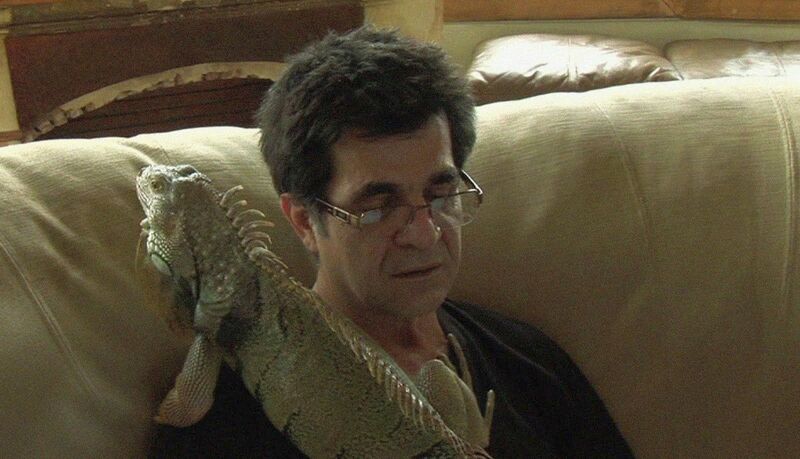 Then on 20 December 2010, Panahi was convicted on the charge of plotting to “commit crimes against the country’s national security” and was sentenced to six years in prison and banned for 20 years from “making or directing any movies, writing screenplays, giving any form of interview with Iranian or foreign media as well as leaving the country” . The movie This Is Not a Film was made in March 2011 when Panahi was under house arrest awaiting the results of his legal appeal of this conviction. Actually it is amazing that Panahi managed to have a film made at all under these restrictive circumstances. Here he is, a man arrested and confined in order to stifle his voice and forbidden to engage in any kind of film activity, shown on camera talking about his situation. This work (not labelled a “film”, of course, but merely an “effort”) is the collaboration of Panahi and documentary filmmaker Mojtaba Mirtahmasb. It was shot during the Nouruz (Iranian New Year) period with the events shown covering Chaharshanbe Souri, the Iranian equivalent of New Year’s Eve. How they managed to smuggle the finished film out of the country must have been a story in itself, because it was apparently coded onto a flash drive that was concealed inside a birthday cake and was eventually screened at the 2011 Cannes Film Festival. 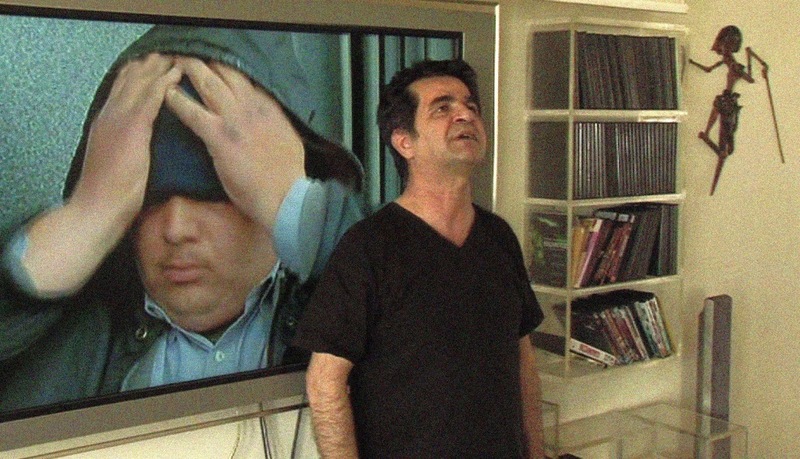 This Is Not a Film opens with Panahi shown attending to routine activities inside his apartment. The focus seems to be on the uneventful tempo of isolated life in the apartment, while outside is heard the sound of explosions, to which Panahi pays no evident attention. Given the relatively boring nature of Panahi’s activities, the viewer’s attention is naturally drawn to what may be happening outside. If the noises are a manifestation of some civil disturbance, why is Panahi so unmindful of it? It soon becomes evident that this day is Chaharshanbe Souri (“Fireworks Wednesday”), because it takes place on the Wednesday before Nouruz, the Iranian New Year’s day. Chaharshanbe Souri is somewhat like July 4th in the US or like Guy Fawke’s Day in the UK, Australia, and New Zealand: people like to celebrate it with raucous noise and firecrackers. Actually this day is of far more ancient vintage than its Western counterparts – it is perhaps 4,000 years old, and representative, as is Nouruz itself, of pure Persian culture. On Chaharshanbe Souri in addition to setting fireworks, people like to make bonfires and leap over them, an act that has some symbolic significance. It’s also a day that can be seen to represent a certain freedom from routine constraints, even rowdyism, as people engage in celebratory antics on the street. Not surprisingly, the conservative religious authorities of Iranian society condemn the day and its activities as un-Islamic, but they have so far not been able to suppress its observance. Relatively early on in This Is Not a Film, Panahi does something that both he (see for example The Mirror, 1997) and his sometimes collaborator Abbas Kiarostami have done before – he breaks the “fourth wall” of the film’s “dramatic stage” and begins to talk straight into the camera about the filmmaking going on. By doing this he actively engages the audience in his concern of how one goes about expressing one’s thoughts in film form. 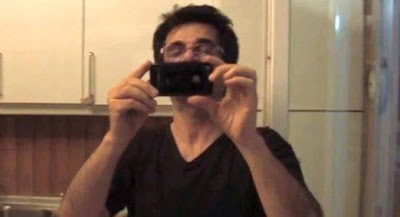 At first in this film, the shots of Panahi had been photographed by a statically placed camera, but soon his collaborator on this occasion, Mojtaba Mirtahmasb, arrives and begins filming Panahi himself. The subsequent dialogue is then understood to be between Panahi and Mirtahmasb, but we viewers, as silent witnesses, are presumed to be part of the conversation, too. Panahi now speaks of a film script that he had prepared and for which he had been attempting to get permission to film. It is based on Chekov’s short story, “From the Diary of a Young Girl” . With the possibility of that filming now closed off, however, Panahi here decides to discuss how that film would have looked in terms of layout and narrative structure. The proposed script concerns a young woman from a conservative family who wishes to attend college. Her father in the story forbids her to do that and has her locked up inside the house. So the film script concerns a girl facing the same kind of suppression that Panahi now faces. As he describes his plans for this story to Mirtahmasb, we get some interesting insights into various aspects of Panahi’s filmmaking approach. One of the most interesting, to me, revelations, concerns Panahi’s modest remarks to the effect that he doesn’t know much about the technical details of cinematography. Filmmakers around the world have varying degrees of expertise at this level, with some being expert camera operators and others leaving the camera work to professional technicians. For example on this score, I also found it surprising to hear some time ago the accomplished Italian filmmaker Ermanno Olmi remark that the great Federico Fellini never ever looked through a camera lens. Nevertheless, given the technical cinematic mastery of Panahi’s previous films and the fact that he has been a film editor in connection with some works directed by others, I would have expected him, in particular, to be highly knowledgeable about film cinematography. 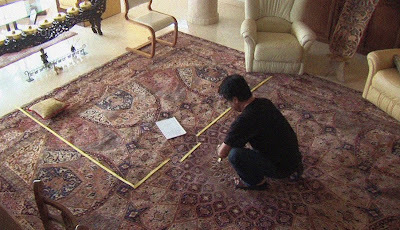 Another interesting stylistic point is the way Panahi schematically maps out his proposed camera setup layout with masking tape on his livingroom rug. Some filmmakers like to do this kind of thing – a sort of overhead-map style layout of where the camera positions should be – while others envision their films in terms of just what will be seen in the film frame. These two perspectives, which we may refer to as the “architectural” and the “subjective”, are quite different. The architectural camera map layout perspective is objectivist, a top-down approach that has an implicit view-from-the-sky attitude that keeps all aspects of the scene in consideration. The film-frame perspective is local and subjective; it is the perspective of a single observer. 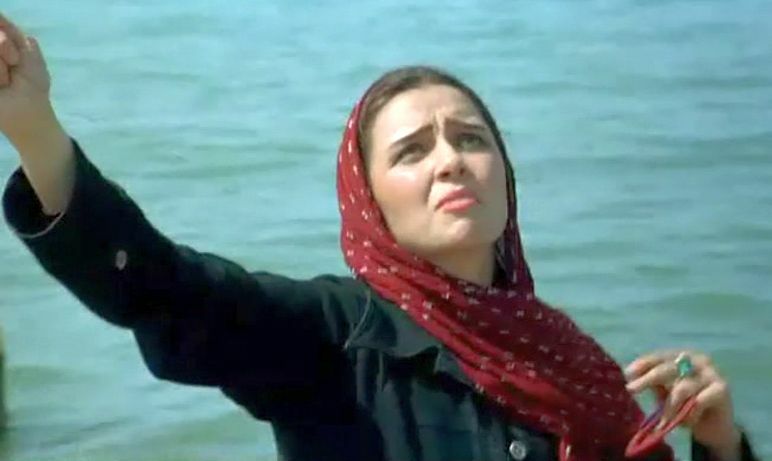 Of course both perspectives are useful in filmmaking, and Panahi does refer to the subjective perspective, too, on various occasions in the film; but it is still a question as to which perspective is preferred by the director. It is my understanding that Michelangelo Antonioni, a visual movement master of both the camera and his players, also preferred to think of the scene from the “architectural” perspective. Also like Antonioni, Panahi says that he generally constructs his film in response to the environmental context of the story: the setting helps determine the narrative structure. In fact he usually doesn’t map everything out beforehand, because he wants the film to be partially constructed at the time of the shooting – certain unexpected aspects of the visual narrative may emerge during the filmmaking process. He illustrates this filmmaking aspect by showing clips from two of his earlier works, The Mirror (Ayneh, 1997) and Crimson Gold (Talaye Sorkh, 2003), which featured unexpected responses on the part of his unprofessional actors that were incorporated into and added to the narratives. In fact such an emergent event apparently occurs in This Is Not a Film, too, towards the end, when a student moonlighting as a trash collector shows up at Panahi’s door and Panahi then goes on to converse with him in the elevator. Panahi’s desire to capture emergent events and incorporate them into his films reflects an emphasis on spontaneity and authenticity. This underlies his remark that he has always shot his films outdoors because of the Iranian government’s restrictions on women’s dress in films. Presumably he finds it artificial and unrealistic to show women invariably wearing the hejab in indoor scenes, so he restricts his action to the outdoors. Like all Iranian filmmakers working inside the country, though, Panahi’s films do not make overt political statements, and there are no villains. They simply show people trying to cope with the social circumstances in which they find themselves. Returning to the events of This Is Not a Film, after Panahi discusses the outline of his proposed film for awhile, he loses interest in further discussions of it. After all, he says, “if we could tell a film, why make a film”. Compare this to Alfred Hitchcock, who famously remarked that the thrill of making a film was in its planning. The actual shooting of the film, for Hitchcock, was merely a boring implementation of the film idea and not a creative activity. The film events in This Is Not a Film finally move to Mirtahmasb making his departure for the evening to attend to his own family’s Nouruz celebration. But just when Mirtahmasb is leaving, the young trash collector unexpectedly shows up; and Panahi decides to accompany him as he makes his rounds collecting trash from the various floors in the apartment building. The young man cautiously, but genuinely, talks about his life, his difficulties finding a job, and other aspects about his life in Tehran. When the elevator gets to the bottom, where the trash is deposited in larger containers, Panahi’s camera looks out on the wide world that is beyond the apartment gates and is full of joyous fireworks. On this view the film closes. Besides the film’s backstory, there have been further, ongoing events. Iran’s Council of Public Culture has declared The Iranian House of Cinema, Iran’s largest professional organization for filmmakers, to be illegal . Mojtaba Mirtahmasb was arrested in September 2011 as he was leaving the country. In December 2011, Mirtahmasb was released, but in that same month Panahi’s legal appeal of his prison sentence was denied. 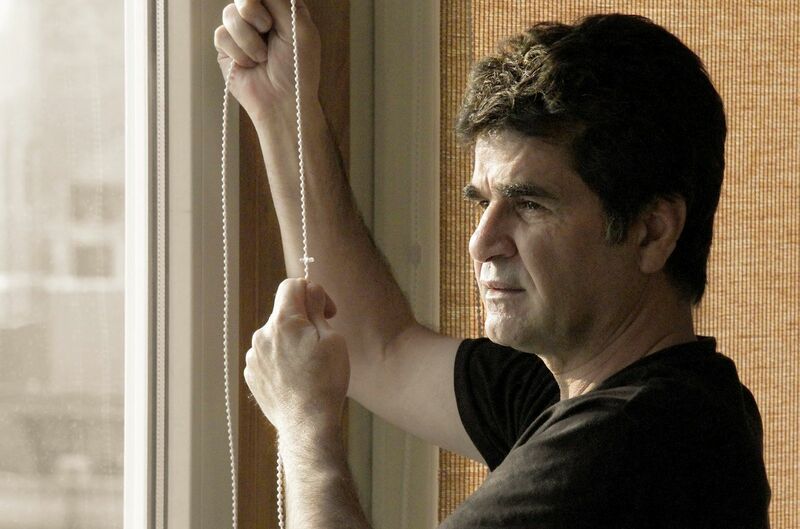 "Filmmaker Jafar Panahi Sentenced to Six Years in Prison", The Green Voice of Freedom, 20/12/2010, http://en.irangreenvoice.com/article/2010/dec/20/2581. This is a one-page story, and you may be able to find a copy of it here. When middle-class Iranians in Tehran have a holiday, they often like to escape their dry urban confines and trek up north to the Caspian seaside, where everything is cooler and greener. It’s also an opportunity for people to be a little more casual and relaxed in the open air. About Elly (Darbareye Elly, 2009) is a deceptively clever film about one such holiday visit, where events don’t go exactly as planned. Over the course of the three-day weekend by the sea, the viewer is exposed to the fascinatingly complex social dynamics of people under stress. In particular, this film has things to say about some of the nuances of Iranian culture under these circumstances (but, of course, much of what happens relates generally to how all of us interact with others). The film was written and directed by Asghar Farhadi, whose subsequent production was the more famous and highly praised A Separation (2011), which won the US Oscar for Best Foreign Film. Without diminishing the excellence of A Separation, however, I would say that About Elly is even better and is Farhadi’s best work so far. Amir and Sepideh are a married couple whose daughter, Moravid, is in kindergarten. Peyman and Shohreh are a second couple with a little boy and girl, Arash and Anita. Manouchehr and Naazy are a third couple. Ahmad, also an old friend in addition to being Naazy’s brother, has returned to visit Iran from Germany, where he recently went through a divorce. Elly is Moravid’s kindergarten teacher and has been invited along on the trip. Sepideh is the vivacious social organizer and energizer of the group. Without her, as she herself points out early on, the entire Caspian trip wouldn’t have happened. One of her principal goals for the trip is to match up the now-available Ahmad with the pretty and modestly charming Elly, in the hopes that romantic developments will ensue. This match-making quickly becomes an open secret among the entourage, and whenever Elly is out of earshot, they all teasingly encourage Ahmad to make his move. When they all arrive at the seaside villa, they are informed by the local caretaker that the villa they want is only available for one night and that there are probably no other nearby accommodations during this busy three-day holiday period. It turns out that Sepideh had known beforehand that only one night was available, but she had not told the others about it, figuring that once they got up to the seaside they could find further accommodation for the other two days. She explains to them her reasoning: if she had told them all beforehand about the villa being available for only one night, she couldn’t have convinced them to set out on the trip in the first place. In her mind, a little deception was needed to make things happen. Sepideh then pleads with the local caretaker woman in private that they really need a nice place, because Elly and Ahmad are on their honeymoon. This little white lie moves the woman to make an extra effort to accommodate the group, and she arranges for an abandoned villa by the sea to be opened up to them. But note that Sepideh’s little fibs are not just incidental to the story; indeed they constitute one of the major themes of About Elly – how do we convey the truth to others? In this connection I would offer the comment that whenever we are in any group, there is a shared understanding concerning issues of mutual concern. We point to people and things in the world in front of us and discuss them, hoping that we understand each other, even though we know that we all have our own individual interpretations about these things. Sometimes, in order to spur cooperative group activity in a certain direction, though, we may exaggerate or even innocently bend the literal truth about something. This of course can be dangerous. The difficulty of conveying exactly what we mean is symbolized early on in the film when the holiday makers have fun playing the game of charades (pantomime game). In that game the goal is to arrive at a shared meaning; but later on in the story words will be used to mislead – to try to generate separated, distinguished understandings of what has happened. Anyway, returning to the film story, as the viewer watches the evolving socializing of the various people, he or she is likely to assume that the principal narrative line will be about the emerging relationship of Ahmad and Elly. But on the second day of their outing (about thirty-five minutes into the film) the story takes a disruptive dramatic turn. The three little children are playing by the beach, and Elly is asked to watch them while the other adults attend to their various activities and chores. The viewer doesn’t see exactly what happens in this situation with Elly and the children, but it soon emerges that Arash has wandered out into the sea and is lost, and Elly is not around. There is now a desperate effort by find Arash in the sea and save him from drowning. The panic-stricken group do just manage to rescue and revive the nearly-drowned Arash, but then the attention of the group turns to Elly. Where is she? The rest of the story is concerned with finding out where Elly is and what has happened to her. There are two conjectures. She may have drowned attempting to rescue Arash. Or she may have abruptly left the group and gone back to Tehran without telling anyone. What makes the second conjecture plausible is that it is known by several group members that Elly had only wanted to stay one night at the seaside villa and then return to her infirm mother back home. In addition, they wonder if the demure Elly had been offended by the boisterous teasing that had been the social undertone of the interactions on the trip. Now the finger-pointing begins. With Elly missing, a police investigation ensues to find out the truth of what happened to her. What had begun in the film as an exercise in social bonding and harmonizing now dissolves into finding blame and searching for excuses to maintain individual innocence. As they attempt to discover the truth about Elly, the group uncovers the many little lies that had been accumulating during their time together. The lies were all understandable within their specific social contexts, but now they are exposed as violations of the truth. Then the story takes another turn when a phone call to Elly’s home in Tehran uncovers the fact that Elly had a fiancé and that upon hearing news of Elly’s disappearance, the fiancé is now rushing to the Caspian area to investigate. This discovery adds a further layer of guilt, because the group may now appear to have some moral taint in connection with having arranged an apparent romantic tryst between Ahmad and Elly. Now the new issue becomes who among the group knew that Elly had a fiancé. To protect themselves, it seems to some of them that further falsehoods may be necessary. These three phases of the film thus reflect the shifting social dynamics among the group. In the first phase of the film, before Elly’s disappearance, the socializing was oriented around finding ways to bond and achieve social harmony. This involves some minor falsehoods, but the goal was to achieve social unity. The second phase covers the period after Elly’s disappearance and before the appearance of the fiancé. Here the social dynamics are all involved with selfish concerns. How can each of them establish his or her own innocence and separation from the group? The third phase, after the arrival of the fiancé, sees the group members reluctantly working together again, this time to arrive at an agreed-upon story to tell the fiancé. So the story moves from group-thinking –> selfish-thinking –> group thinking as it evolves through the three phases. As the story progresses, all of the characters, including Elly and her fiancé, participate in deception in one form or another. Most of these falsehoods, particularly those of Sepideh, were uttered in support of group harmony, not just for selfish reasons. In fact the biggest liars in the story, Sepideh, Ahmad, Manouchehr, and Naazy, are the most selfless and compassionate. They exude innocence. The three characters most closely adhering to the literal truth, Amir, Shohreh, and Peyman, are in fact the most selfish people in the story. This is what makes About Elly a fascinating tale. We generally make knee-jerk affirmations about the importance of telling the truth and not lying. But the story about truth is often more complicated in social situations. When should one really utter the unvarnished truth? That is a question that goes back at least as far as Plato’s Dialogues. Indeed the title, “About Elly”, is ironic, since the film is really “About Self” and how the selfish individual relates to a group. The people in this story are mostly concerned with themselves and have little empathy for Elly . In About Elly, Farhadi has pulled off a tour de force that cinematically evokes aspects of Michelangelo Antonioni’s work, which also often involves complex ensemble acting performances. Indeed Farhadi remarked in a recent interview that earlier Italian filmmakers had a major influence on his development. Particularly comparable here is Antonioni’s L’Avventura (1960), which also begins with a group of people on a holiday that is disrupted with the early disappearance of what appeared to have been the major character. 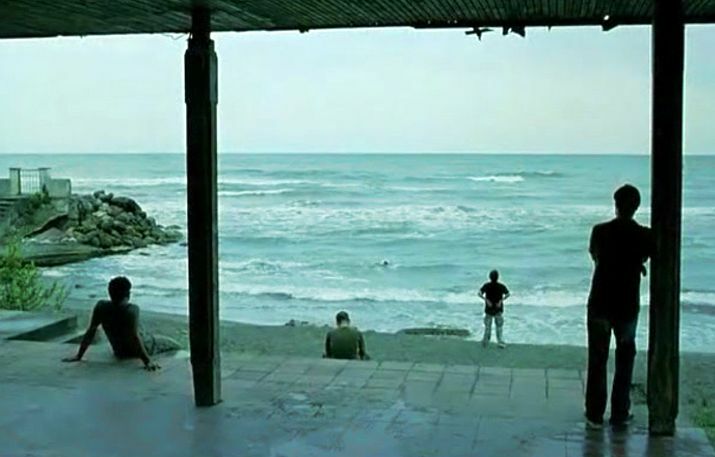 But while Antonioni’s focus in L’Avventura eventually centers on two remaining characters, Farhadi accomplished the more difficult feat of maintaining the narrative focus on the entire ensemble throughout About Elly. It’s interesting that Farhadi manages to maintain the visual coherence of this collective interaction without using as much complicated moving-camera cinematography as was employed by Antonioni. Unfortunately, Farhadi again resorts to shaky, hand-held camera framing in order to evoke emotional agitation. To me this technique is distracting and ineffective. On the other hand, I must admit that the in-the-water close-up cinematography used in the rescue of Arash scenes (how could this be done without agitated framing?) is convincing and very effective. The acting performances in About Elly are uniformly superb. 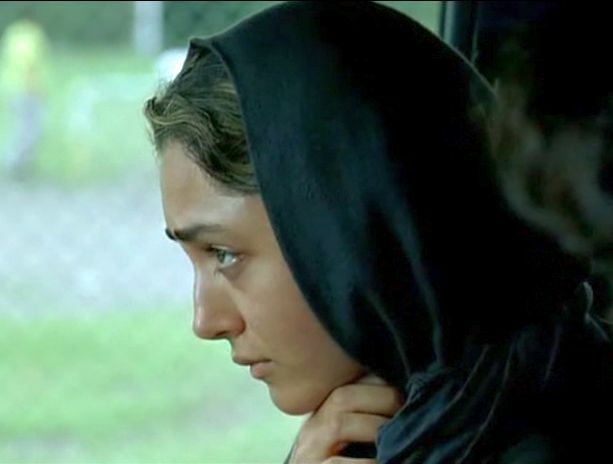 Golshifteh Farhanai's performance in the role of Sepideh is particularly compelling, but all the principal characters have distinct personalities and associated social proclivities that are consistently and believably sustained throughout the film. As the tension mounts during the various crises, each person responds in a way that drives the organic behaviour of the group forward. This is what makes the ensemble performances work so well and achieve a whole that is greater than the sum of its parts. Of course, there is a special Iranian flavor to what goes on in About Elly. As you would expect, there is the nuanced social backdrop concerning how men and women behave towards each other, particularly inside a traditional culture such as Iran’s that is also influenced by modernism. But there is also an even more specifically interesting Iranian cultural attitude that should be highlighted in this connection, and that concerns the cultural attitudes about literal truth. In general, I would say that Iranians have a stronger-than-usual cultural inclination to avoid telling people what they don’t like to hear. And this can often involve concealing the truth. This tendency to prevaricate may be culturally reinforced by the Shia Islamic tradition of taqiyya, which sanctions hiding the truth in certain circumstances. The disposition to occasionally mislead is also probably supported by the famed Iranian tradition of social etiquette, known as taarof, which directs people to speak and act with the utmost courtesy. One might argue about the proper boundaries and limits of such practices, but their sustained existence in Iranian cultural behaviour offers clear evidence that successful social interactions go beyond black-and-white utterances about what is true and what is good for the overall group or society. In fact many times we don’t know exactly what is true, and mere adherence to a literal, but uncertain, truth about something may not lead to the most “positive” (an admittedly interpretation-dependent term) course of action. Thus in the final verbal exchange that takes place in About Elly, Sepideh evidently lies one last time. Was this final lie ultimately a selfish act? You can reflect on what her reasons may have been for doing this and whether or not you agree with them. The Farsi word in the title, ‘Dabareyeh’, means ‘concerning’ in English and has been translated as ‘about’ in the English version of the title. But ‘about’ has additional connotations in English beyond ‘concerning’, including 'around' or 'nearby'. This injects some extra suggestive meaning into the English form of the ironic title.